Please read the page carefully. I am a piano mover in South East London, SE19. I need a local assistant for occasional part time work as part of a small team. No previous experience is needed.. I need reliable presentable people with the ability to listen to and follow instructions. The work is varied and enjoyable for the right curious individual willing to learn. Ideally, you will be around for a long time, rather than passing through. I undertake work for schools, theatres and the public. 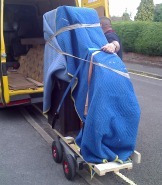 We move pianos and organs locally and longer distances. You will need to be able to apply yourself to, and enjoy physical work but you don't need experience or unusual strength. We are most definitely not weight lifters. I decline work I consider too hard, difficult or dangerous. Whereas you need to be able to apply yourself both physically and mentally, people of slighter build can apply with confidence (there is a role for people who can both slip between tight gaps and fit comfortably in the van!). Expect plenty of travel time. Piano moving is about careful techniques and problem solving and every job is different. It will be important that you can fit in with my team. This position may suit a student or any person who has other flexible commitments. This position is not suitable for people looking for full time work. Live within a couple of miles of West or Upper Norwood, Dulwich or North Croydon. Are not fazed by early starts. 1) Your name and age. 2) Postcode where you live. 5) Your available days and times, and any commitments together with any other relevant details. 6) Tell me how you get about town. I do not wish to see your CV!